John F. Kennedy’s Square in city of Aalborg in Denmark is with the railway station and bus terminal an important traffic hub that connects Aalborg to the surrounding towns and most of the bigger cities in country. With Aalborg Municipality’s desire and strategy to change the habits and move citizens from cars to bicycle and public transport, large space problems have arisen in connection with parking spaces for bicycles. The bike rails are crowded and illegally parked bikes fill up the street scene and create dangerous pedestrian situations. 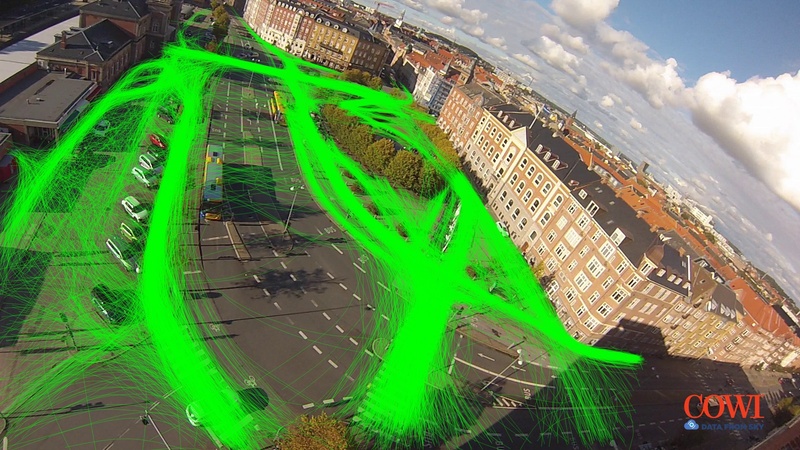 In order to find the optimal location of bicycle parking facilities, the movement patterns of each traffic participant, especially pedestrians and bicycles, were analyzed using DataFromSky advanced software – see the pictures attached below, representing the trajectories of bicycles (blue) and pedestrians (green). Based on these patterns, detailed data, statistics and trajectories information, COWI has performed a study examining where it will be possible to implement more parking places for bicycles in and around the square, resulting with a proposal for how the space can be furnished – offering more space for bicycle parking and rest areas for pedestrians. 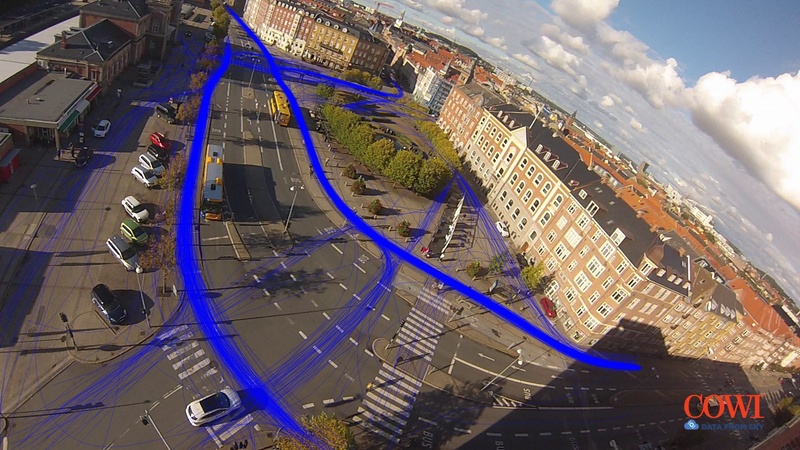 DataFromSky analysis has also resulted in illustrations of average speed of pedestrians in this square. The data were used to design areas where pedestrians typically stop and where there may be a need for seating (e.g. near the bus station), moreover, these information and data are extremely valuable for a safety study in a given zone, which can be adopted by the municipality to make some changes in order to increase the safety of pedestrians and bicycles in analyzed area. If you are interested in knowing more details and want to read the full study, click on this link. Our solution can be used for tracking not only cars and various vehicles, but also for tracking other objects and traffic participants, for example pedestrians or bicycles. 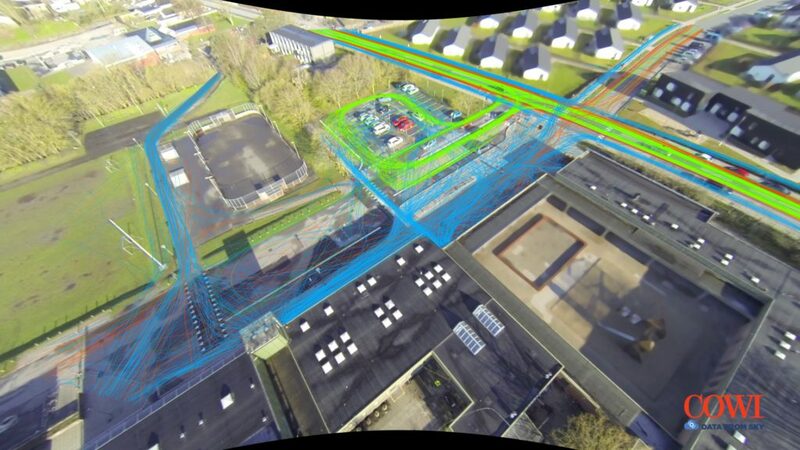 Our partner from Denmark – traffic engineering company COWI – is currently studying and analyzing the behaviour of traffic participants in surroundings of schools and kindergartens in Denmark by using DataFromSky for the analysis. It would provide a new and systematic overview of the situation during the morning peak hour, when many students arrive to school at the same time. More detailed, they are searching for some inappropriate and dangerous behaviour of road users and other participants of the traffic, which includes all the parents driving their children to schools, school buses, bikes, motorbikes, other vehicles passing by the neighbourhood and all the pedestrians. Based on this analysis it is easier to formulate some proposals of changes which should be adopted by schools to protect the safety of schoolchildren. This analysis can also lead to better decision making done by municipalities, whether to build a new crossing or add some safety features etc. 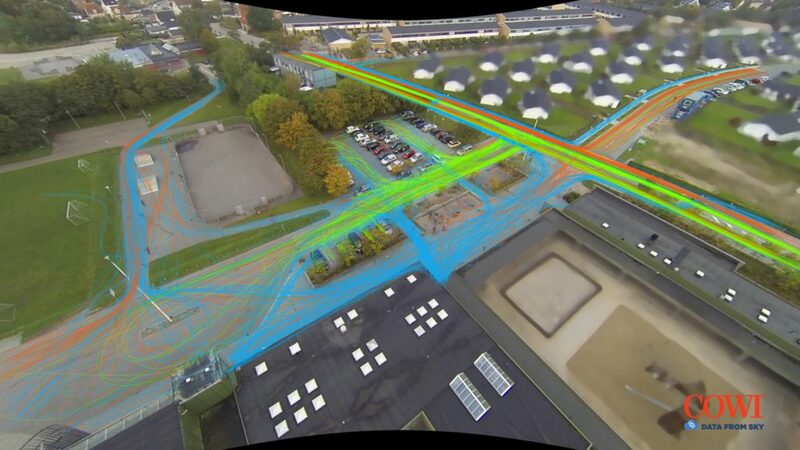 An example of mapping the behaviour of traffic users is shown in the pictures below, where different user types have different color and each line shows the traffic flow for one trajectory. Picture: Before (1.) and after (2.) changes: Each line shows one trajectory. Pedestrians (blue), cyclists (red), drivers (green).